NextDealAddict provides the best online shopping experience for Desert Zytel Handle for the tech-enabled consumer, one that you want to return to again and again. Sleek and minimal, this survival knife from Fallkniven cuts a serious figure. It makes for a steadfast camping partner, always at the ready to clear tree branches, split kindling, open cans, and dress wild game as needed. You'll never have to worry about this knife losing its edge while you're out in the wilderness; its sharp edge holds up under even the most extreme duress. Could it be indestructible? We can't say for sure, but we do now that this is the definitely knife you should buy if you want a lifelong tool. This knife comes with a Zytel sheath with a built-in belt loop. 5 1/4 inch closed. Black epoxy powder coated AUS-8A stainless partially serrated clip blade with ambidextrous thumb studs. Desert Zytel handles with black rubber inserts. Lanyard hole. Desert nylon belt sheath than can be worn vertically or horizontally. 4 5/8" closed linerlock. 3 3/8" satin finish 8Cr14MoV stainless standard edge blade with oversized dual thumb studs. Thumb ridge. 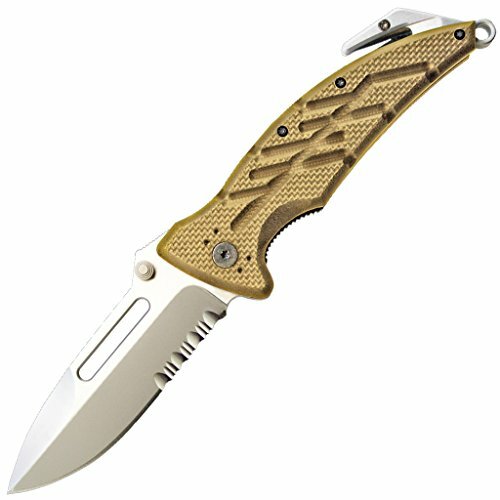 Satin finish frame with desert tan Zytel handles with zigzag design for strength. Deep finger choil for exceptional grip. L.A.W.K.S. locking mechanism. Lanyard hole. Stainless pocket clip. BRK Exclusive! 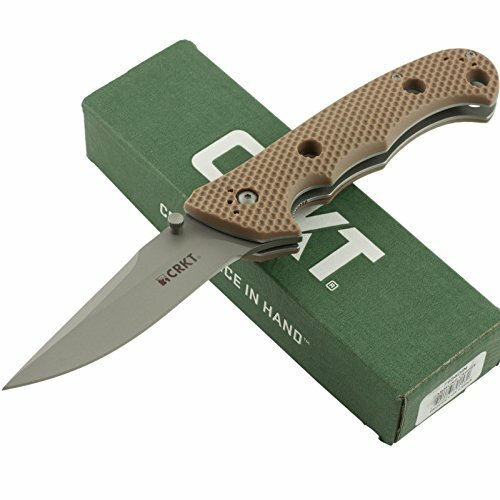 Heavy-duty lockback folder is big, feels solid in the hand, and is tough enough to tackle the most demanding chores. Knife made in Taiwan. Sheath made in China. Specifications: - steel: AUS 8A stainless steel - blade type: folder - lock style: lockback - grind: hollow - edge angles: 15 degrees - handle material: Zytel - blade type: half serrated - shape: clip - HRc: 57-59CR - stamp: Ka-Bar - pocket clip: yes - overall length: 9 1/8" - blade length: 3 7/8" - blade thickness: 0.135" - weight: 0.45 lb. 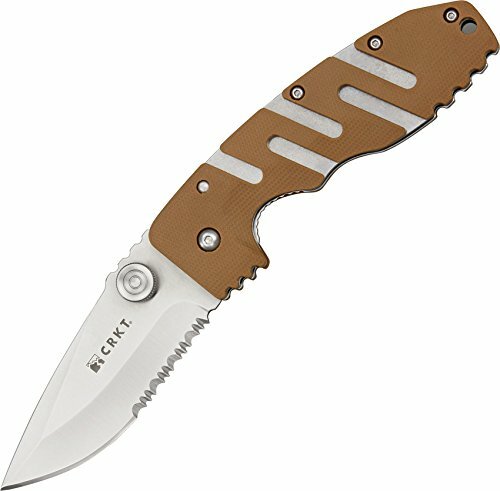 CRKT Hammond Desert Cruiser. 5 1/4" closed linerlock. Partially serrated 8Cr14MoV stainless modified clip point blade with satin finish and ambidextrous thumb studs. 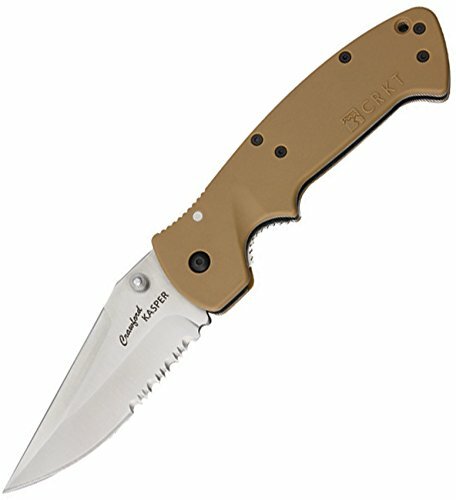 Desert tan Zytel handles with pocket clip. Features LAWKS safety system. Jim Hammond design. 5. 38" closed. 3. 88" desert tan TiNi coated partially serrated 8Cr14MoV stainless drop point blade. Tan Zytel handle. Thumb stud. Pocket clip. Lanyard hole. 5 1/4" closed linerlock. 3 3/4" black coated stainless modified clip point blade with dual thumb studs. Features LAWKS safety system. 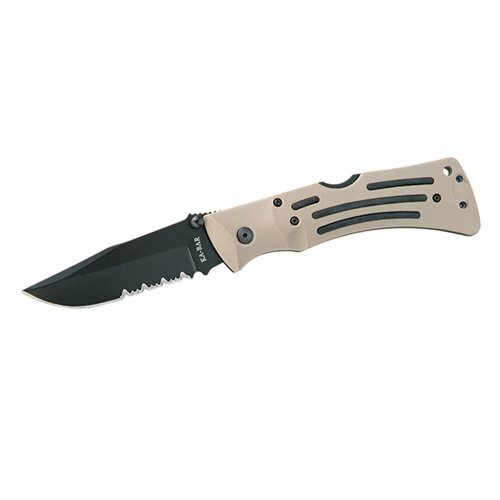 Desert tan Zytel handles. Dual lanyard holes. Reversible black finish stainless pocket clip. Also includes an extra pocket clip with screws. BRK Exclusive! 5. 38" closed. 3. 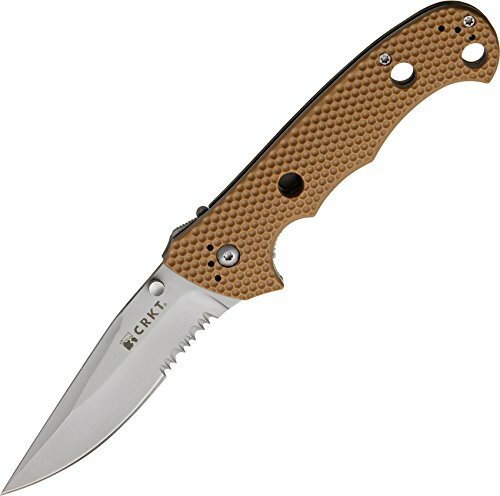 88" tan finish 8Cr14MoV stainless drop point blade. Tan Zytel handle. Thumb stud. Lanyard hole. Pocket clip. Boxed. 5. 38" closed. 3. 88" satin finish partially serrated 8Cr14MoV stainless drop point blade. Tan Zytel handle. Thumb stud. Pocket clip. Lanyard hole. Boxed. Designed specifically for use in emergency situations. The XR-1 are precision balanced, lightweight, and tough. Smooth blade deployment every time with littler cleanting required. 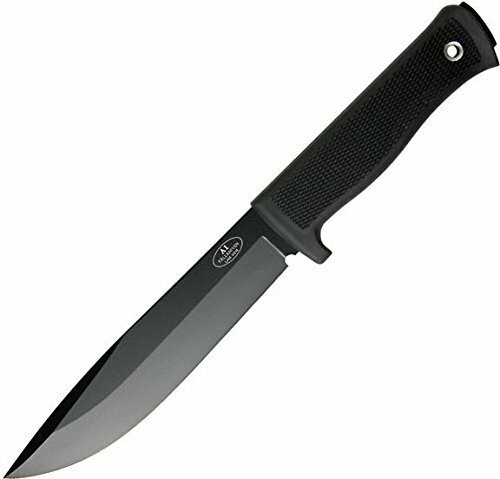 N690Co Cobalt enhanced stainless steel blade, 3.375-Inch blade length, 8.15-Inch overall length, 5-Inch closed, .19-Inch blade thickness, Zytel handle material, liner lock, satin blade finish, thumbstud, reversible pocke clip, lanyard hole, weight 5.5-Ounce. 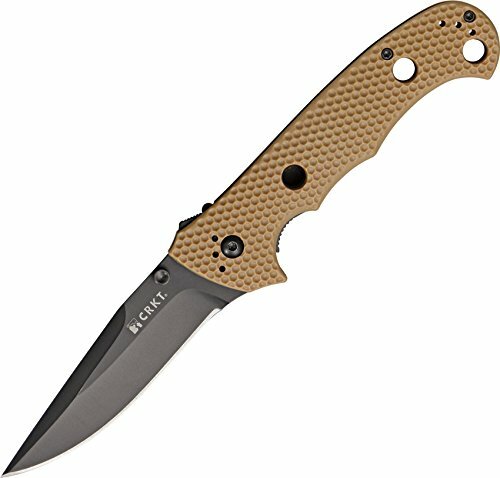 CRKT Hammond Desert Cruiser. 5 1/4" closed linerlock. 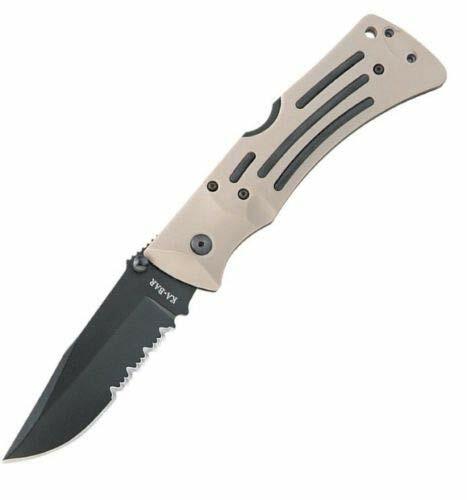 Matte finish 8CP14MoV stainless standard edge modified clip point blade with dual thumb studs. Desert tan Zytel® handles with pocket clip. Features LAWKS safety system. Jim Hammond design. Customers who bought Desert Zytel Handle also bought Personalized Coco Mat, Analogue Mixing Desk, Passive Electric Bass - you may also be interested in these popular items.